ICAI recently released CA IPCC Practice Manual For Nov 2017. This is the latest ICAI Practice Manual IPCC Taxation PM for students to prepare for their upcoming exams. 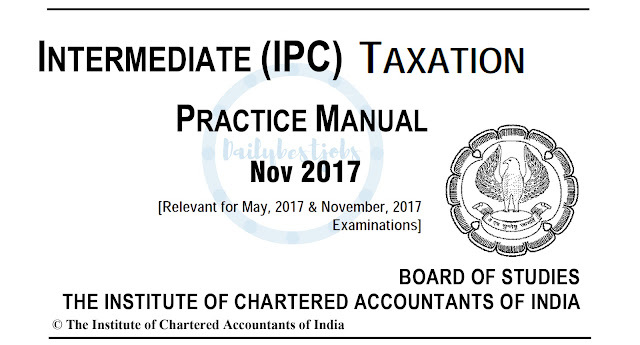 We have shared with you those IPCC Taxation Practice Manual for Nov 2017 exams in pdf download. Past IPCC toppers who cleared CA IPCC exams suggested using only ICAI Practice Manual & Study Materials. So, From below you can Download IPCC Taxation Practice Manual Nov 2017 for your exam preparation. CA IPCC Taxation Practice Manual Nov 2017 in pdf are available to download from the below-provided link. We will also upload more other practice manuals for other subjects here soon. You can Subscribe your email below to get our updates and keep checking our website for practice manual, certified copies & important notes. We just added here IPCC Taxation Section B Indirect Tax Practice Manual for November 2017 examinations as amended by the Finance Act, 2016.